The rather cheeky Signal Gallery has challenged all of us, from the panda lovers to the miserable cynics, to see this exhibition and remain with our hearts unmelted. They believe it can’t be done, so I donned a cynical hat & decided to find out for myself. Now, to be frank, I sit somewhere towards the cynic on this particular scale. It’s not that pandas or cute things don’t appeal to me, but that I often have an aversion to anything ‘cute’ depicted in an artwork. I think in my gut I feel it’s cheating just a little – somehow enhancing the artwork’s true value by playing to the ‘aaah’ factor (as it has been called). All very well if you just want a nice cuddly picture on your wall, but if you want something that runs a little deeper, a work of art that wows through the skill and creativity of the artist as well as the attractiveness of the subject, then you have to be a bit more discerning. A few weeks ago at the Animal Art Fair on London’s Southbank I experienced mixed feelings – some real talent, but rather a lot of artwork that, whilst it was well executed, also remised that certain deeper thread of meaning and imagination that I sought. There seems to have been a glut of animal based shows of late, and I’ve been impressed by only a few who have managed to achieve this deeper level or even something slightly more profound. In April, Abigail Box’s stunning paintings of lions and tigers heightened my senses. Her altered canvas spaces in The Great Escapeat The Exectution Room allowed me to explore her collaged realities. Then later in Spring, Moonstruck at the Menier Gallery with artists Richard Symonds and Suzie Marsh showcased skillful, characterful drawings and sculptural pieces. 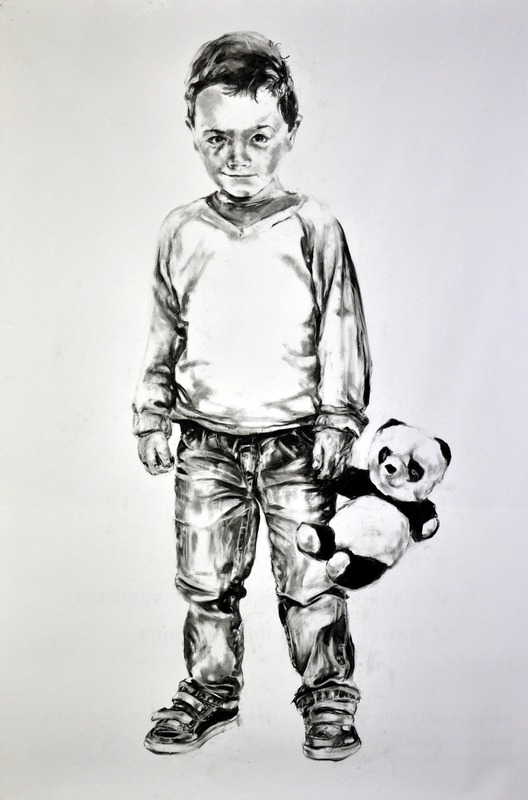 The artists spent a whole year immersed in the artistic study of bears in China, and the exhibition supported the charity ‘Animals Asia’ in their work to end the cruel practice of bear farming. Of course you can still experience some pickled cows, suspended sharks, drunken butterflies and severed cows’ heads at Tate Modern’s Damien Hirst show until September, or sample Hirst’s painted birds, butterflies and animal bones at the White Cube until 8th July – this is animal art devoid of any ‘aaah’ factor (indeed, it has much more AAARHH! factor). Somehow that is imbued with a truthfulness to me, although some would argue that we could launch a similar attack on his use of sensationalism. 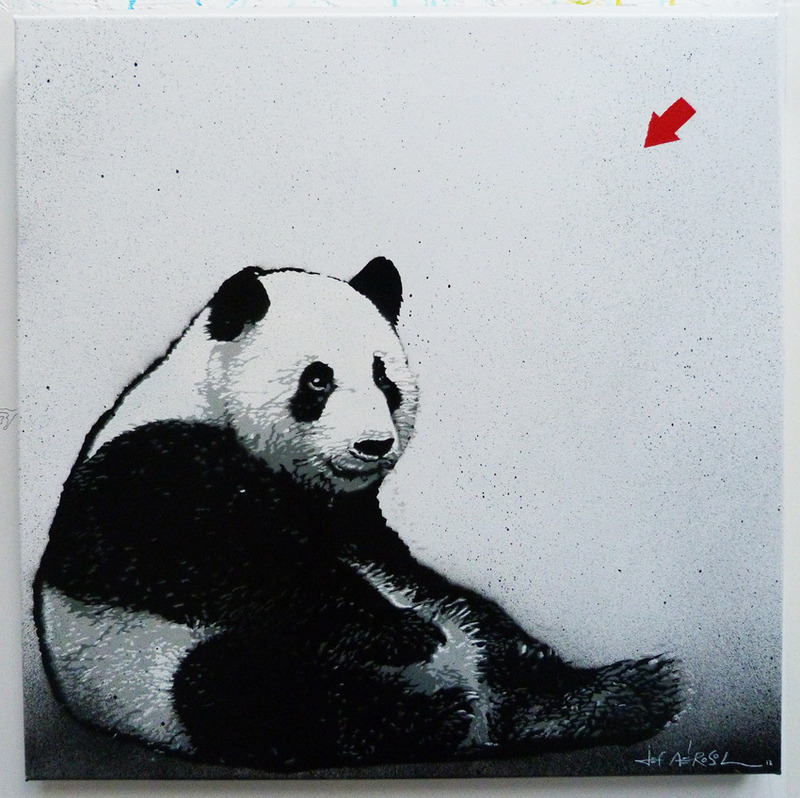 The defiant Pandamonium exhibition has tackled the subject by looking at the panda as an iconic image. 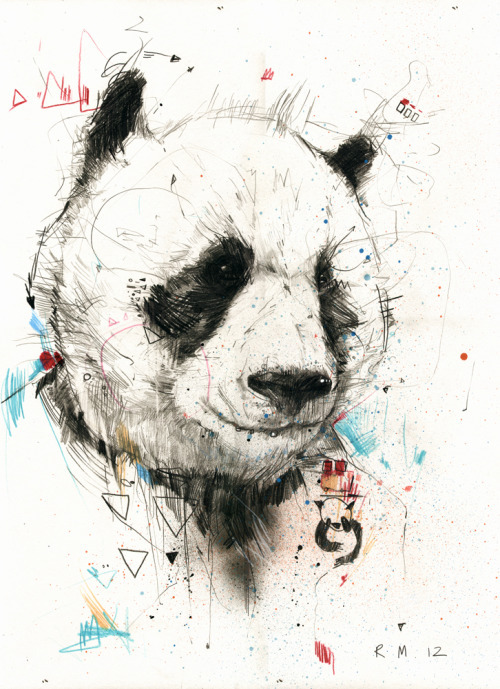 “Over the years, it appears that several of our artists have become inspired by pandas,” say Signal Gallery, “in whatever form they emerge, whether as the bear itself or a human figure sporting an animal mask… So we thought… why don’t we ask a large group of artists to pay homage to the Panda and produce an entire exhibition dedicated to the cuddly creatures, resulting in a sell-out, recession-proof show?” Well, why not? Signal Gallery has also gained the support of the WWF (World Wildlife Fund). They say “We will be donating some of the huge profits made from the show to help protect our furry friends.” Well let’s hope that’s the case for the sake of the pandas – especially after London Zoo’s pandas had a rather ineffective wrestle in the hay earlier this year. The Panda is the rarest member of the bear family and among the world’s most threatened animals. 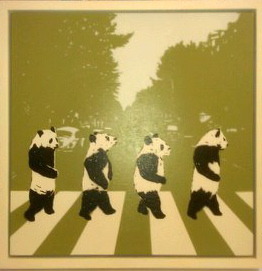 But is Pandamonium recession proof because it is cute and collectible or because of genuinely remarkable artwork? You can decide for yourselves by popping along to the show or perusing some of my favourite pieces below – but I should warn you that, as does happen occasionally, my cynical hat was blown right off. The show was well executed, and many artists really did inspire. ‘For whom the bell tolls’ by Dale Grimshaw. 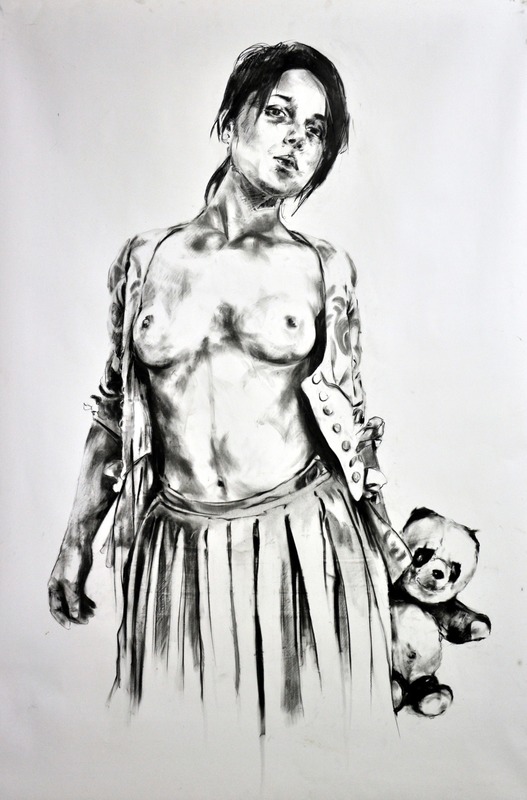 ‘Pandarize’, a colourful and multi-layered haunting image from TRXTR stands across the room from some beautiful large scale charcoal and pencil pieces, including Frank Rannou’s drawings of people holding a panda teddy bear, which left me with an uneasy feeling of the uncanny. Yes Signal Gallery, I am heartened by the fact that this is a show that sticks to the principles of having noteworthy art on its walls, not just playing to the punter via the cute-factor. Visit the show before it ends on Saturday 16th June – I suggest you wear your hat too and see if the work can get into your mind-cells as well as your eyeballs, (and OK, maybe into your heart, just a little). 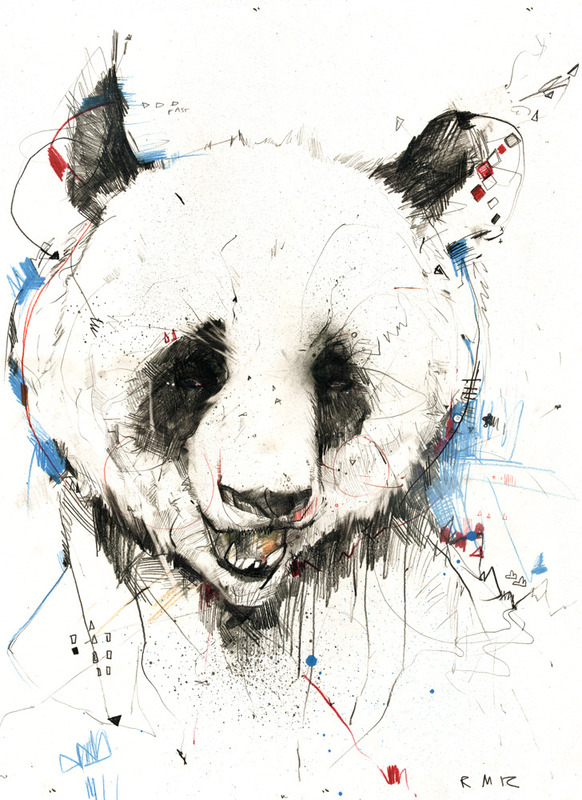 Artists include: C215, Dale Grimshaw, Jef Aerosol, Elinor Evans, Byroglyphics (Russ Mills), SPQR, TRXTR, David Le Fleming, Gaye Black, Frank Rannou, Joram Roukes, Chris Bell and newcomers to Signal; Lora Zombie and Jane Price.